Today over on The Twinery blog, there is a wonderful showcase of cards from The Twinery designers featuring their yummy bakers twine along with some fab products from Clearsnap. I recieved this really awesome set of butterfly stamps and a Classic Pigment Cat's Eyes Color Queue from Clearsnap to work with this week. For my clean and simple (CAS) card, I added three differnt colors of the pigment inks to each of the images before stamping them on the white cardstock. Don't they look lovely?!? Huge thanks to Clearsnap for providing us with the wonderful inks and stamps. Wonderful card! 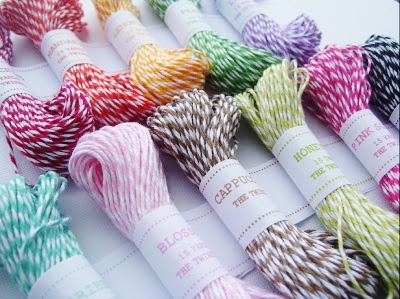 I really like the stitching and twine together and such great colors! 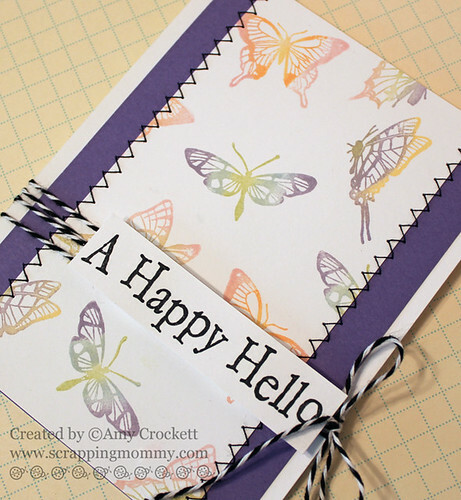 Love the multi-colored stamping and the Charcoal baker's twine just sets the whole thing off perfectly! So pretty! The mult-colored butterflies are gorgeous and I love the stitching ans twine! Love this---the multicolored butterflies with the dark twine=perfection! Love the stamping and the way you used the twine! So cute! The stitching really makes the card and twine POP! Lovely card- love the mulit-colored butterflies! I love the multi-colored butterflies. So pretty! Im also quite envious of your use of stitching as well. Me and my sewing machine have a love/hate relationship. Great card!!! Love the butterflies, and the different colours you used! Love the way that you inked up those butterflies and made them multicolored. Thanks for the idea. Very pretty--I like how you inked up the butterflies. The triple colored stampind is fun! Lots of useful ideas, thanks!! Love the twine on these projects! A great card and love the treatment of your sentiment with the bakers twine, very creative. Great card and love how you used the tiwne and the sentiment together. Great idea. Very pretty card, thank you so much for sharing it. A simply beautiful card -- just love the tricolor butterflies. Beautiful stamp work! Thanks for the chance to see your great work and possibly win a great prize of great twine from The Twinery. awesome card , love the colors! Love your butterflies! Thanks for sharing and for the chance to win. Your card is soooo cute, I love it!! I love the colors and stitching on your card. Great job! I love how you did the colors in the stamping! Very pretty! Thanks for sharing! Great card you do wonderful work! Oh... I like the butterflies :) The black stitching and the black in the twine and lettering really show them off! I love those stamps. So fun and colorful! Very cute. very pretty card. like the stitching on the sides. tfs. p.s. I'm already a follower! Great card. I love the butterflies. This is a stunning card Amy. I love different shades on the image. Beautiful!!! Beautiful! Definitely a happy hello!